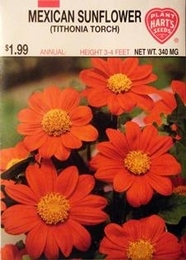 Mexican Sunflower - Tithonia Torch, Tithonia rotundifolia. This heat-resistant, drought tolerant variety produces a bushy hedge that blooms with bright orange flowers by mid-summer. Makes an ideal hedge or border that is excellent for cutting. As the name implies, Mexican Sunflowers require plenty of sunshine. Plants will withstand drought conditions which may stunt growth. Keep blossoms picked for best results.